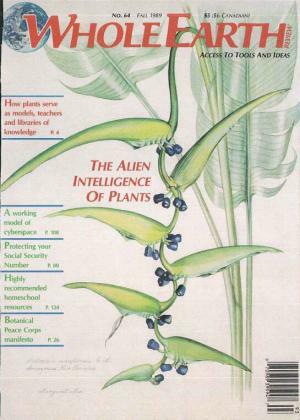 An eBook of this issue is available for $2.00. In order to purchase it, you must log in or create an account. eBooks are dual-layer PDF files, which means that you will be able to select and copy text from them, if need be. The following articles and book reviews from this issue are available online. No book reviews are available online for this edition. If you would like to see what an eBook download looks like, we have put together a free sample for you, which is our stand-in for the first Whole Earth Catalog. This file contains the cover from the first Catalog, and a few pages from the 30th Anniversary Edition, which contained a reprint of the first Catalog. A Note About the Electronic Editions: We realize that there are some issues with the presentation of the publications within the Flash component. The idea was to try to get as close as possible to the experience of holding the Catalog in your hand and flip the pages. As of July 2010, we have moved all of our electronic editions to a new host. If you experience slow performance with the Flipbooks, be sure to email us at webmaster [at] wholeearth [dot][com[. If you register for an account, you can purchase just about all of the publications in PDF format. The Back Issues page identifies which ones are available as eBooks. In some cases, we actually have original copies for sale, so look for those too.